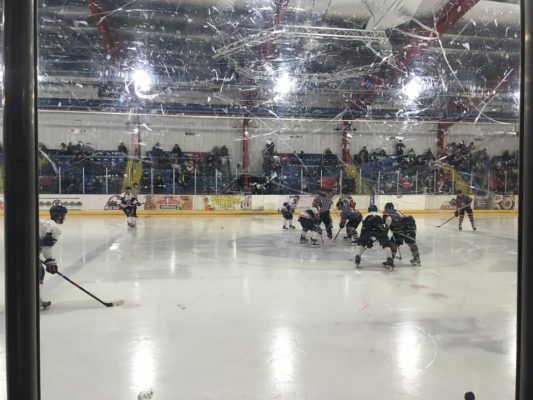 Invicta Dynamos fell short with a narrow 2-1 defeat to Basingstoke Bison in their final league match of the season. Goals from Alex Sampford and Adam Harding sealed the points for Ashley Tait’s side despite a Louis Colvin equaliser. The hosts were without Ryan Giles, Joe Allen, Arran Strawson and Harrison Lillis. While Basingstoke Bison were only missing former Mos defenceman Elliot Dewey. Within the first few minutes of the game the Dynamos controlled the play as Jake Stedman lost the puck in the Bison zone, but Luke Thirkettle skated it and took a slapshot from the top of the circles, but it flew above the net. Bison tried their luck at the other end but Connor Morris padded the puck into the corner. Anthony Leone retrieved the puck and with no other option, took a wrist shot from centre ice down towards Dan Weller-Evans who made an easy save. Louis Colvin created a turnover in centre ice. The Dynamos forward skated towards Weller-Evans and fired a wrist shot which flew past the shoulder of the netminder. Dynamos scored at 8:55, which put them in the lead 1-0. A slashing penalty on Ryan Morgan, gave the Bison a chance to level the score. Adam Harding sent a slapshot from the top of the circles, the puck hit the post and fell behind Morris. Bison levelled the score at 12:39. Dynamos continued to fire shots at Weller-Evans who made save after save. The Dynamos set themselves up but Oskars Ancitis could not finish his shot. Bison put pressure on Morris and thought they had scored but the netminder managed to save the puck just before it crossed the line. Brandon Miles skated up the wing from the faceoff and sent a hard shot towards Weller-Evans who managed to glove the puck. End of the first period and the teams tied 1-1. At the beginning of the second period, Ondrej Zosiak was on the breakaway but two Bison defencemen shoved him and Zosiak tripped and slid into the boards. First powerplay chance for the Dynamos as Harding was sent to the penalty box for tripping. However, Bison managed to pin the Dynamos in their end and took several shots on Morris which the Scotsman managed to save. Leone skated up the wing but was met by Michal Klejna who stood firm and the two bounced off of each other. Leone unhappy with Klejna’s hit, landed a huge check against Richard Bordowski who was sent crashing into the boards. Leone sat two minutes for interference for his hit on Bordowski which gave the visitors another powerplay. After several minutes of scrappy play in front of the Dynamos net, Miles managed to skate the puck out of the zone and passed to Leone who took a shot on Weller-Evans. Ashley Tait collected the rebound and skated straight down the ice dodging the Dynamos players as he went. Tait was left alone with Morris but the netminder used his shoulder to send the puck flying upwards. A penalty on Zosiak saw another powerplay for Bison who managed to score their second goal of the night. Three Bison players surrounded the goal and their first shot knocked Morris to the ice. One of the Bison players fell on the Dynamos netminder. Andy Munroe managed to block one incoming shot but the second hit the back of the net. The Dynamos players were unhappy with the referees call to allow the goal. Bison led the game 2-1 with their second goal timed at 36:02. Miles still angered by the Bison’s second goal skated after Klejna who was interested in fighting with the Dynamos forward. However, the two exchanged shoves behind the play which resulted in Klejna being pushed down to the ice. The pair received two-minute penalties for roughing. End of the second period and Bison led 2-1. Third period saw a few hard hits as Miles and Ralph collided for a huge hit centre ice. While Best later planted a massive check on Bordowski. Both teams took shots but the two netminders stood strong and protected their nets. With less than two minutes left Invicta called for a timeout. Morris returned to his net. As the Dynamos pinned Bison in their end, Morris then left his net to allow for the sixth skater. A few close calls but the Dynamos managed to keep the puck in the Bison end. Less than 15 seconds left to play, and Bison called a timeout. Morris remained on the bench and the six Dynamos players tried their hardest to get shot after shot past Weller-Evans but was unable to. Dynamos put up a fight against the Bison. However, Basingstoke Bison were the ones who left with two points. This entry was posted	on Sunday, March 17th, 2019 at 8:30 pm	and is filed under Featured, Ice Hockey, Other Sports. You can follow any responses to this entry through the RSS 2.0 feed. Both comments and pings are currently closed.